In radio frequency drying, material is exposed to an electronic field that alternates about 40,000,000 times per second. When the field alternates, the water molecules in the material also alternate. The resulting friction causes the water to heat uniformly throughout the product. 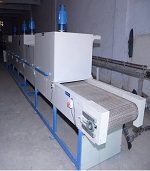 Radio frequency drying can save energy because only the product itself is heated. Another benefit is that no equipment warm up or cool down is necessary. The technology typically replaces process steam heat. The RF Web Dryer rapidly removes moisture from the web at low temperatures and prevents the migration of coating solids caused by conventional drying which increases web strength and product quality. INCREASES PRODUCTION THROUGHPUT: Providing instant ON/OFF control, the RF Web Dryer eliminates the heat-up and cool-down times required by conventional dryers. MINIMIZE DRYING TIMES: Rapid volumetric heating eliminates the long dwell time required by conventional heating minimizing the quantity of product in the drying cycle and reduces changeover time.